Remake. 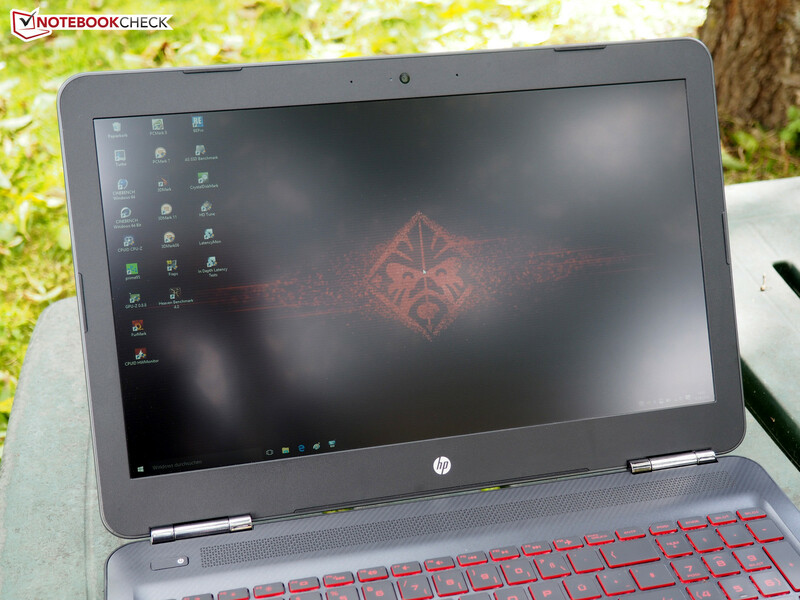 For the 2016 version of their Omen, HP does not stop at a simple hardware refresh, but also updates the notebook with a stylish new chassis. 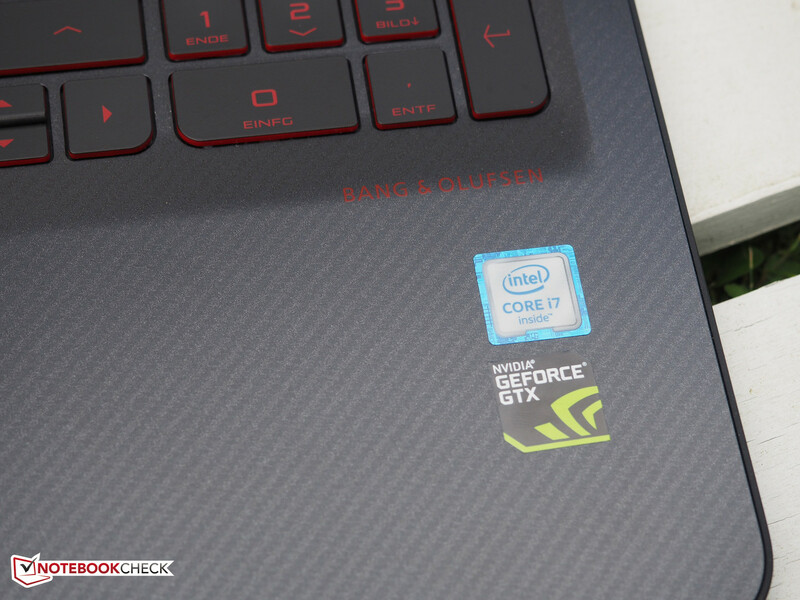 We take a closer look at the 15-inch version with GeForce GTX 965M. What follows are our impressions. 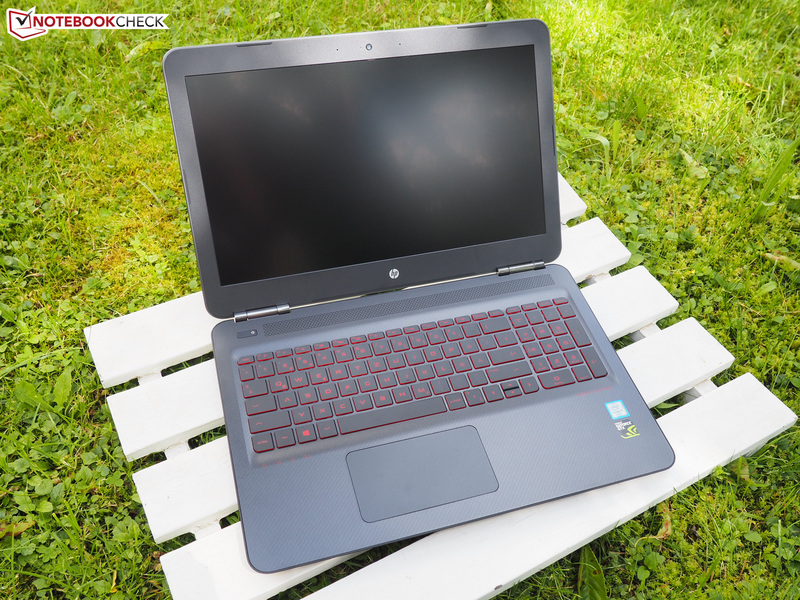 At the beginning of 2015, HP released an elaborately-designed - and thanks to a Core i7-4710HQ / GeForce GTX 860M combo quite high-end notebook - aimed at occasional gamers. Fast forward 1.5 years and HP decided on a complete update, which addresses the hardware components as well as the chassis. The changes under the hood affect primarily the CPU and the GPU. 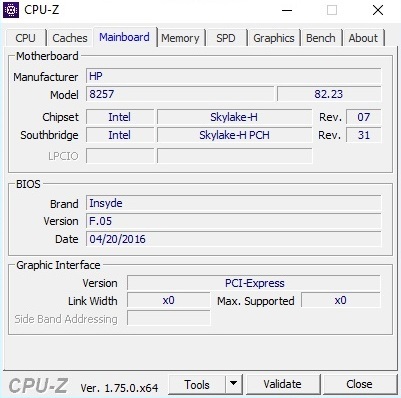 Instead of a Haswell processor, the new version sports a Skylake model. Although the Core i7-6700HQ isn't clocked any higher than the predecessor, it's a little faster thanks to the modernized architecture. 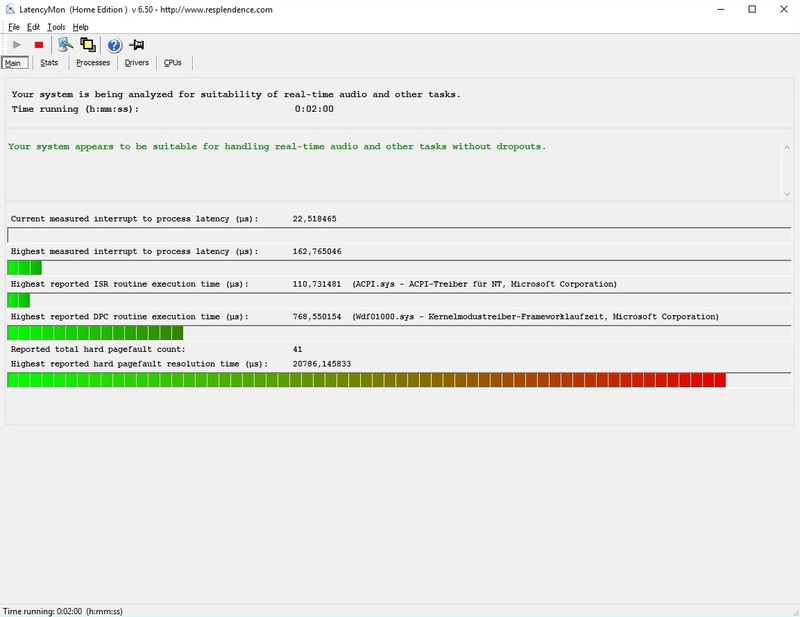 The Omen does benefit the most from the more powerful GPU: even though both the GTX 965M respectively the GTX 960M are based on Nvidia's Maxwell architecture, the performance gain compared to the GTX 860M is pretty noticeable and can make the difference between "stutters" and "just playable" depending on the settings. 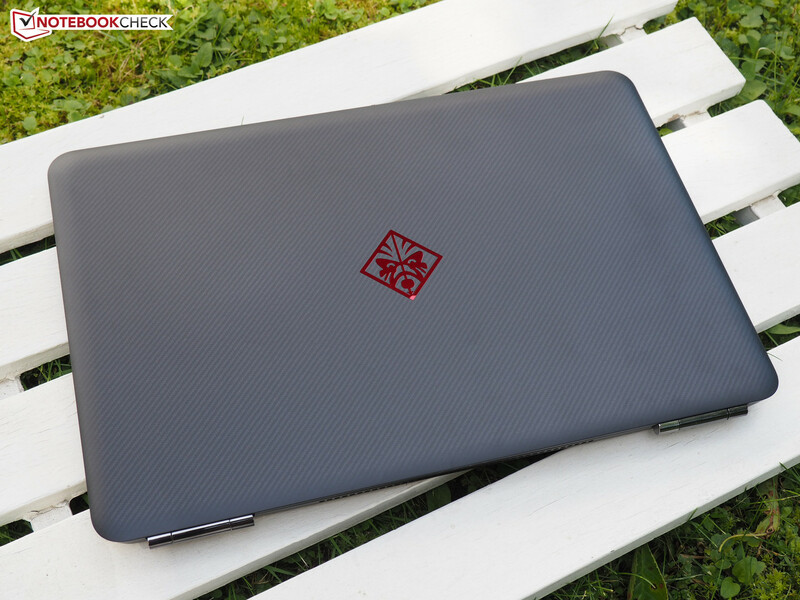 Our review notebook - the Omen 15-ax007ng - sells for about 1300 Euro (~$1470) and comes with a matte IPS display with a resolution of 1920 x 1080 pixels, 16 GB DDR4 RAM (2x 8 GB, both slots in use) and a combination of a 128 GB SSD and 2 TB HDD. The OS is Windows 10 Home 64 Bit, which is pretty common choice. 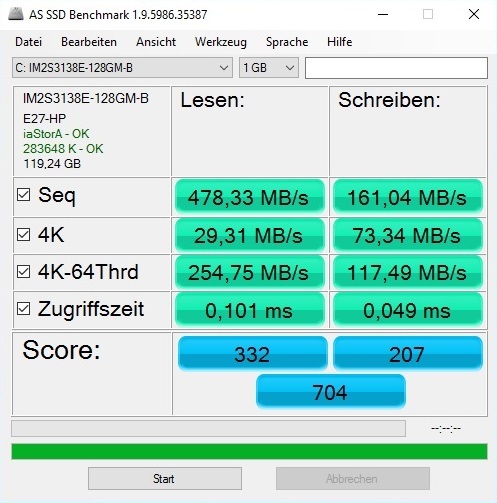 Less expensive variants of the notebook (for example the 15-ax005ng, which sells for 1110 Euro / ~$1250) have a less powerful GPU, less RAM and/or a smaller hard drive. The 15-ax008ng for 1500 Euro (~$1695) on the other hand boasts a 4K display. Our Top 10 list of mobile gaming rigs shows that there's plenty of competition in the 15-inch segment at a price point of between 1000 and 2000 Euro (~$1130-2260). Examples are the Asus G501VW (84 %), the Gigabyte P55K v5 (83 %), or the Schenker notebooks XMG C506 and XMG A516 (82 %). 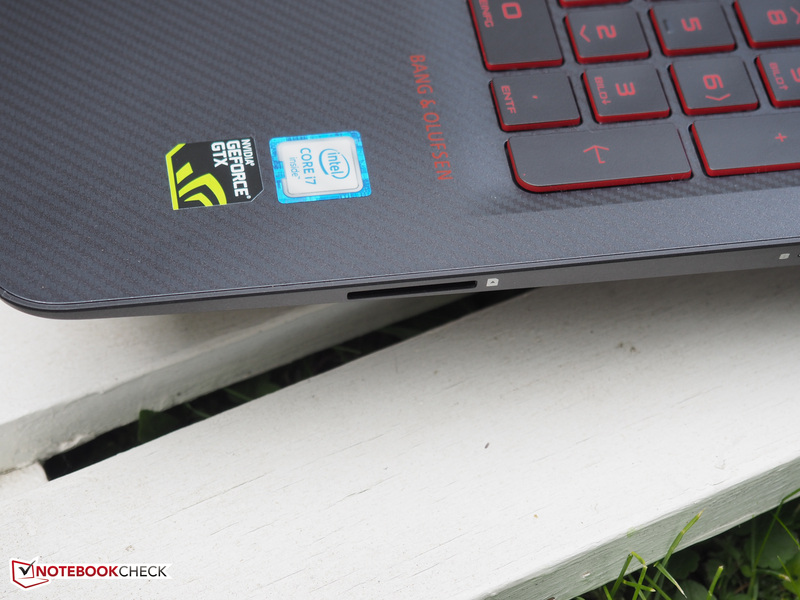 The Black Edition Acer V15 Nitro heads up this list with an overall score of 85 %. Bad news first: from a quality standpoint, the new chassis is more of a step backward than forward. Although the build quality of the 2.2 kg unit is still decent, it can't quite compete with the previous version. Responsible on one hand are the materials: the 15-inch notebook is made from plastic, which doesn't feel as upscale as metal. 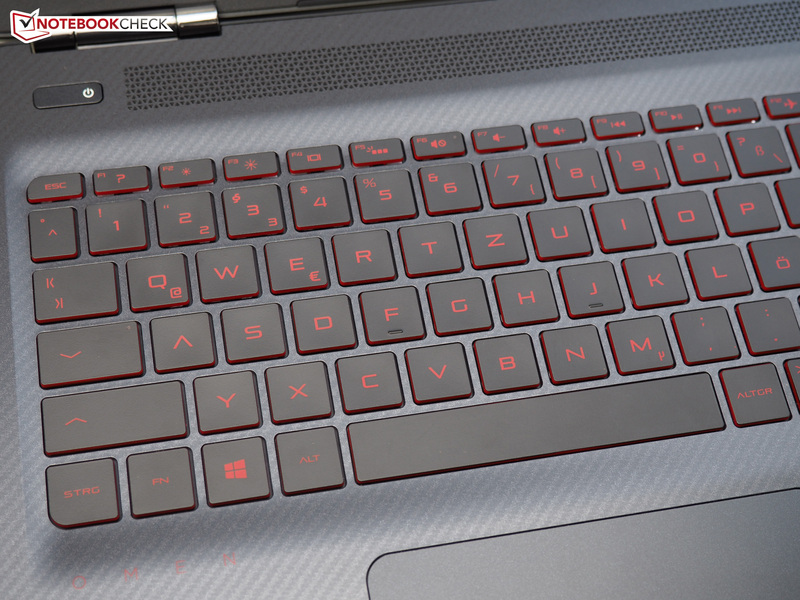 Thanks to the pretty mesh-texture design on the lid and the keyboard area, the Omen at least looks the part. The chassis does emit creaking sounds in some locations, however, which just doesn't fit with the upscale image. Let's look at the positive aspects: all things considered, we do like the new chassis quite a bit. 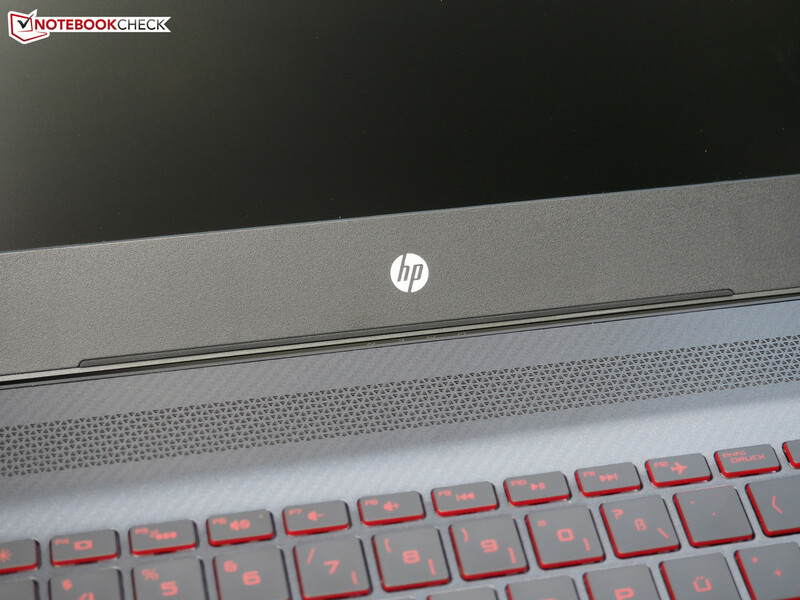 HP addressed a few issues we uncovered during our last review and either improved them or eliminated them altogether. First up is the new display lid, which is now much less "cutting edge" than the previous version, which had very sharp edges. We also like the optimized port distribution. While the first version had ports on the rear, which made them difficult to reach, they are not located on the left and right edges. We applaud the return of the RJ45 LAN port, although the notebook now has one less video out. The lack of macro keys might displease some users - despite the fact that there is a dedicated number block. 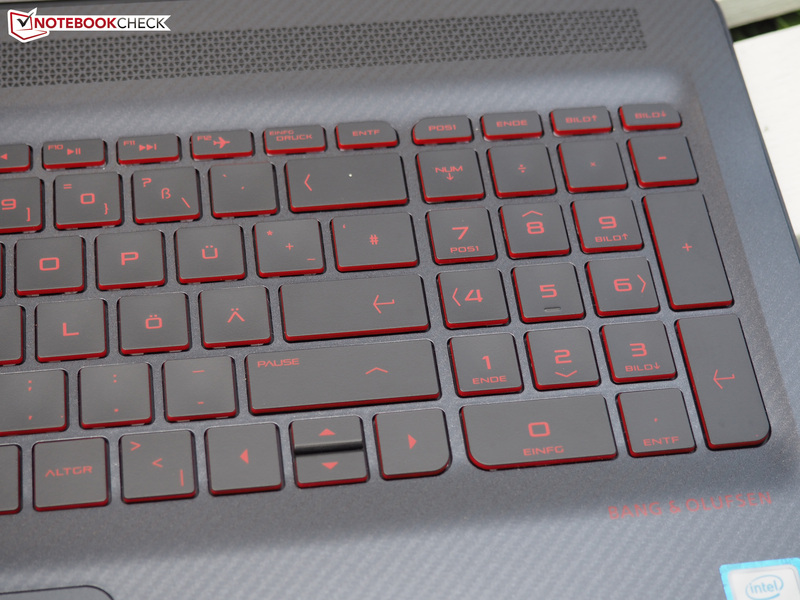 We think this is a good design choice though, as it is easier to familiarize oneself with the keyboard without having to spend time to learn the layout. Most other changes are visual ones, which don't affect the quality directly. Separated hinges here, speakers in a different location there: it really doesn't matter much as far as day-to-day use is concerned. Same is also true for the red accents on the keyboard and the display lid. Much more important is the fact that HP decided to forgo the touch display, which isn't really useful for gaming anyways - especially since the glossy panel was prone to reflections. On disadvantage: the display bezel is a bit too wide. As far as the sturdiness is concerned, the chassis rates about average. The base unit is pretty resilient, but the display lid could be stiffer still. One comment regarding the hinges, which are pretty stiff: even though the base unit rotates up a little, it's still possible to open the display one-handed. The display doesn't bounce much even when the notebook is jostled around. One of the main drawbacks of the Omen is the lack of available physical ports. HP is way too stingy here in our opinion and fails to integrate a DisplayPort and USB 3.1 Gen2 port. 2x USB 3.0, 1x USB 2.0 and one HDMI port isn't much for a notebook designed for gaming - especially considering the price of 1000 Euro (~$1130). 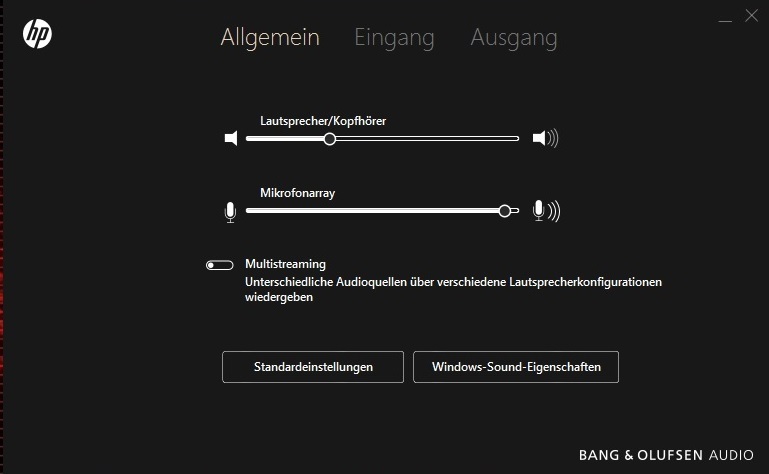 HP also integrates a 3.5 mm combo audio-jack instead of separate jacks for headphone and microphone. The competitors Acer, Asus, Gigabyte and Clevo are clearly superior here. As we mentioned earlier, HP deserves praise for the well thought-out distribution of the ports. Since all of them are located in the rear part of the chassis on the left and right sides, both left and right handers are not restricted in any way when using a mouse or other peripherals. For a few months now we've been checking the performance of integrated card readers. The Omen once again scores about average with sequential read speeds of 86 MB/s and 75 MB/s when copying 250 JPEG files. According to an attached sticker, our reference SD card Toshiba Exceria Pro SDXC 64 GB UHS-II should transfer at speeds of up to 260 MB/s. While the network module comes from Realtek, the wireless module is sourced from Intel. The Wireless AC 7265 isn't exactly brand new, but it supports all the important features like Bluetooth, WiDi and (up to) WLAN 802.11 ac (maximum 867 Mbit/s, 2.4 & 5.0 GHz). The range is decent: we had four bars at a distance of 10 meters through several walls and doors at a speed of about 100-300 Mbit/s. Maintenance isn't exactly a straightforward matter. The bottom of the chassis appears to be removable, but we didn't exceed even after several attempts. Either the cover is attached in a way so it needs to be pried away with tools, or the rubber cover in the middle houses another hidden screw (10 are visible). 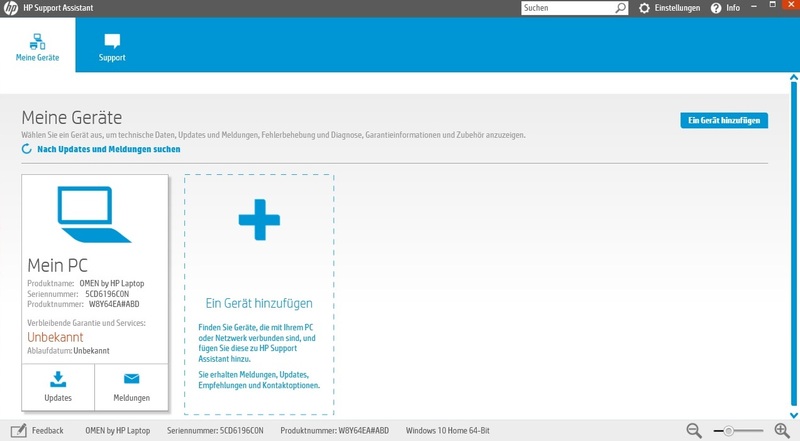 Since we received our review example from the online retailer notebooksbilliger.de, we wanted to avoid damage at all cost, so we didn't proceed. One thing is certain: the processor and the GPU are soldered on and can't be removed. We expect the cooling fans, the M.2-Slot (SSD), the 2.5-inch slot (HDD) and both DDR4 RAM slots to be accessible, however. 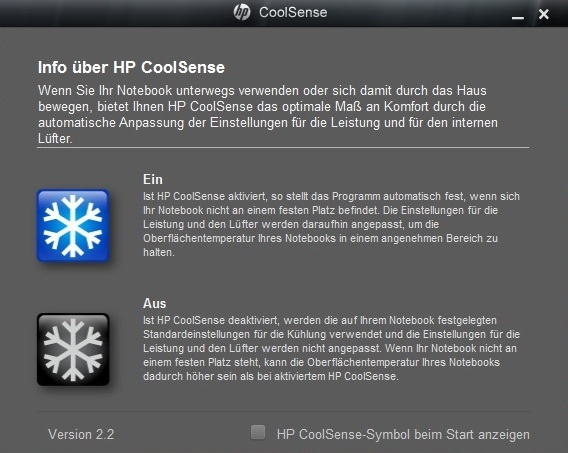 HP has preinstalled a lot of their own programs and tools. 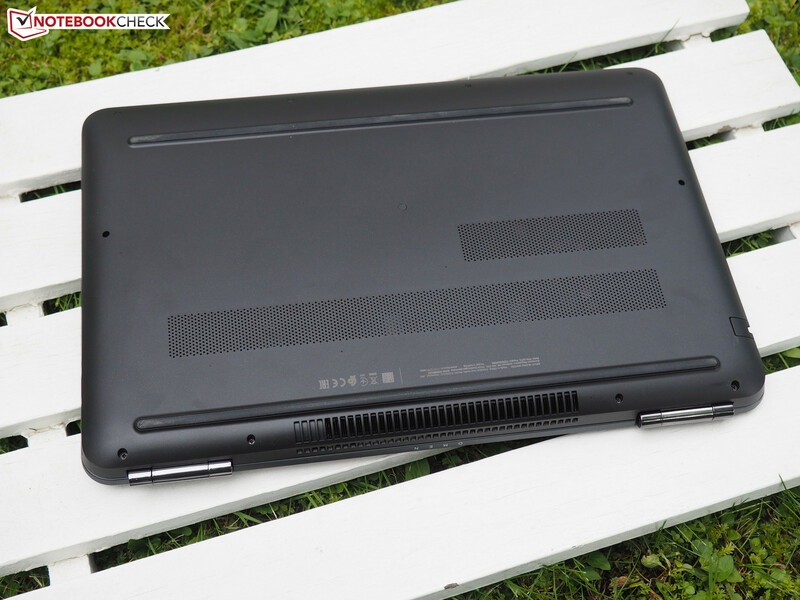 Examples are 3D DriveGuard, which protects the hard drive from shocks or CoolSense, which adjusts the performance and the fan speed during mobile use. There are also trial versions of Office 365 and McAfee Internet Security. CyberLink and Adobe products (see screenshot) and 25 GB of virtual storage round out the package. 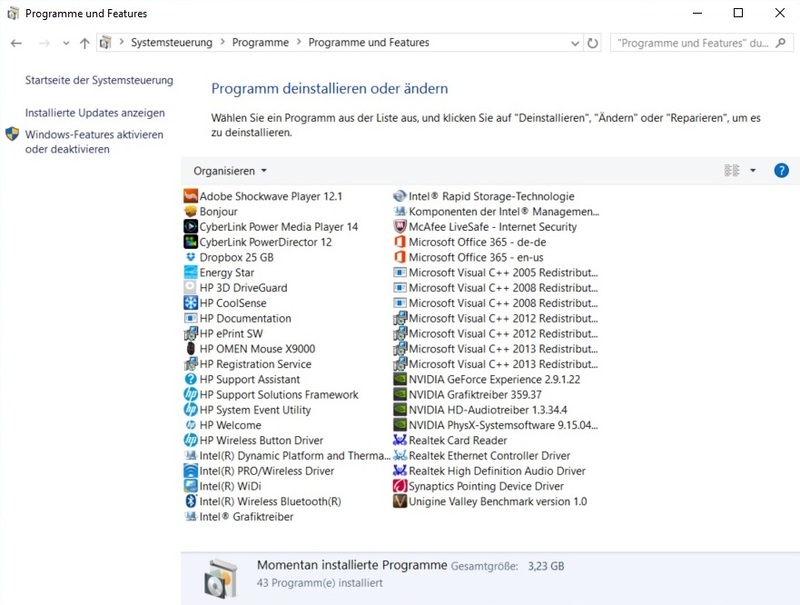 The rest of the software consists of drivers and component software. Just like with the physical ports, HP seems to follow the mantra "tight is right" as far as the accessories are concerned. Aside from a quickstart guide, a few info pamphlets and the power adapter, the shipping carton is empty. In Europe, the Omen is covered for 2 years against manufacturer's defects (Collect & Return service). Like most other manufacturers, HP relies on a chiclet-type keyboard. All things considered, the keyboard is good enough, but not great. Key actuation is decent, although we prefer the stroke to be stiffer (the keyboard tray does flexe in some areas. The key travel is comparatively short. 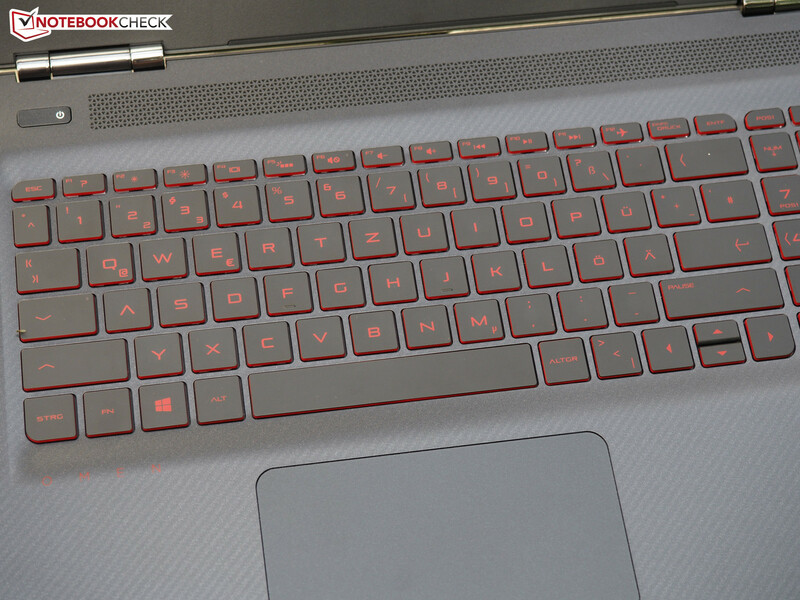 Thanks to the red backlight (on/off only), working, surfing or gaming at night is certainly possible. When the backlight is deactivated, the red lettering proves to be a disadvantage, as white would assure better visibility. On the plus side, the Omen comes with a dedicated number block. The key size of 15 x 15 mm is pretty standard, although the middle arrow keys and the keys in the function row could use a little more height. 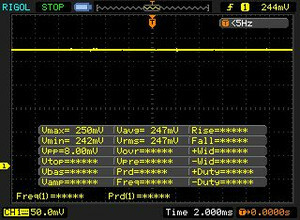 The special functions (volume, brightness, etc.) are activated by pressing the Fn key at the same time. 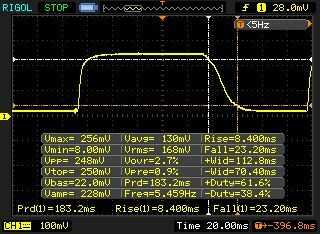 This behavior can be changed in the BIOS if so desired. Very nice is the fact that the keyboard is located all the way up top, so the palm rest areas are very generous. 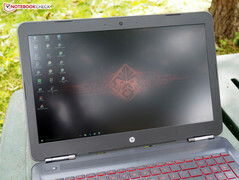 HP uses a clickpad for their new notebook. While this type of pad has the advantage that clicks are generally more comfortable to execute, the lack of dedicated buttons has disadvantages as well. Many clickpads suffer from a lack of precision and robustness. 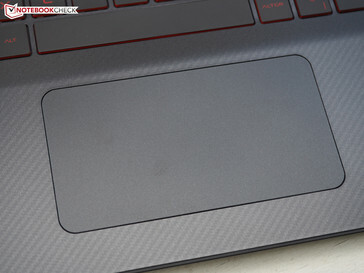 Even though the Omen doesn't fall into this category, we would prefer a "regular" touchpad since it likely would be more precise and would rattle less (the keyboard noise is about average). Multitouch gestures work flawlessly. Two-finger inputs allow the user to zoom or scroll. The overall size of the pad is OK: the width of 12 cm is very generous, but the pad is only 6.5 cm deep. 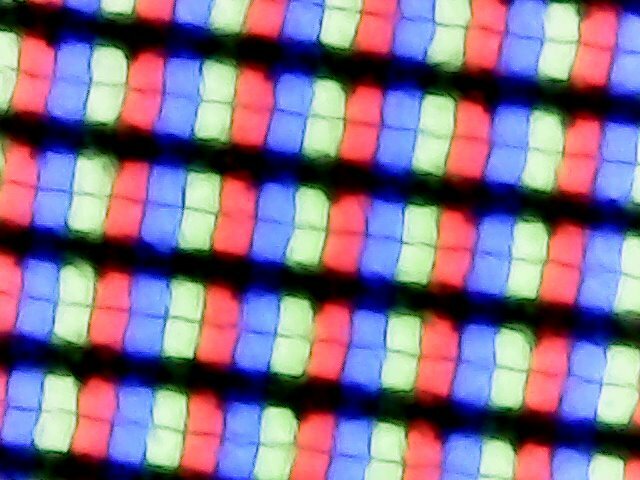 The picture quality of the FHD display is somewhat disappointing. 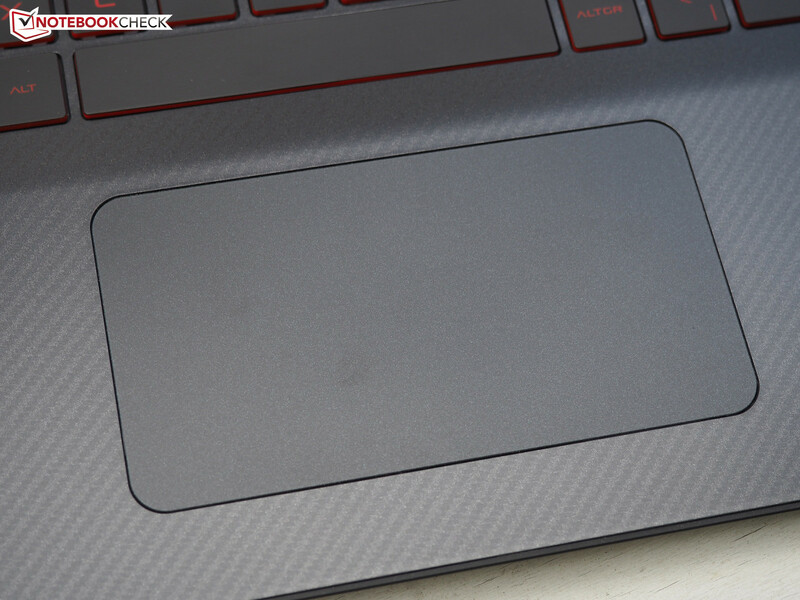 Although the IPS panel looks good at first glance, we discovered a few flaws after using the notebook for a while. The main issue with the display in our opinion is the lack of brightness. We measured 203 cd/m², which might be sufficient for inside, but not quite for outdoor use. 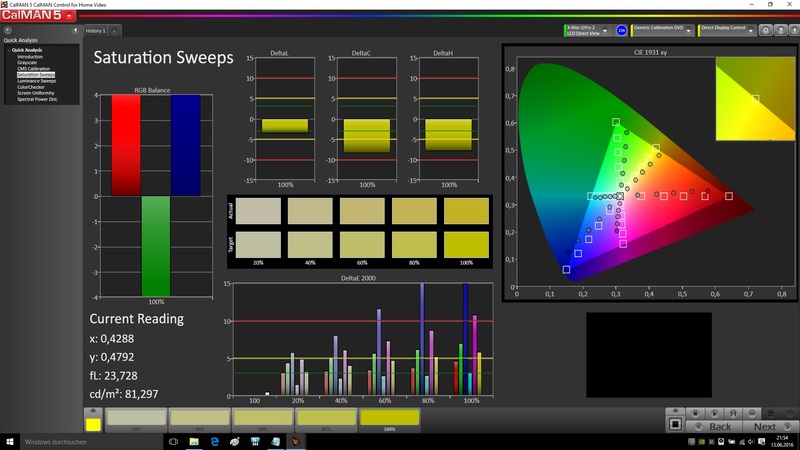 The second drawback is the lack of coverage as far as the professional color spaces are concerned. 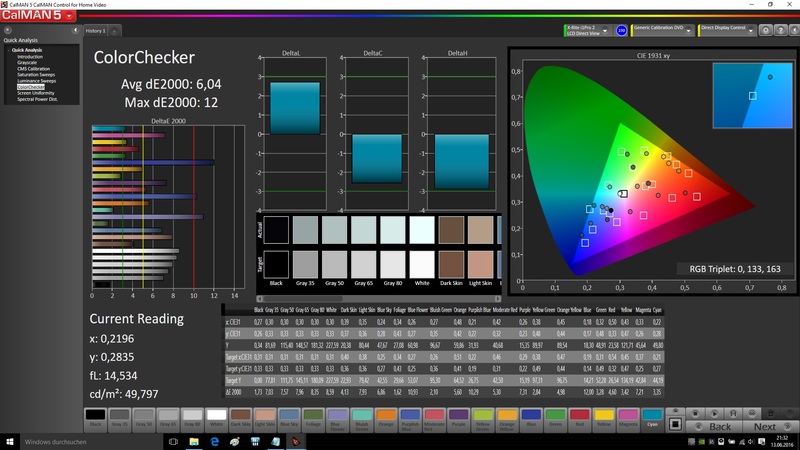 With a coverage of 60 % for sRGB and 38 % for AdobeRGB, the HP display clearly trails the FHD panel of the Asus G501VW (97/63 %) and the 4K panel of the Acer V15 Nitro BE (100/86 %). The contrast follows suit at 764:1 vs. 1066:1 respectively 1377:1. We have to be fair: compared to a standard display based on TN technology, the colors actually look quite good. 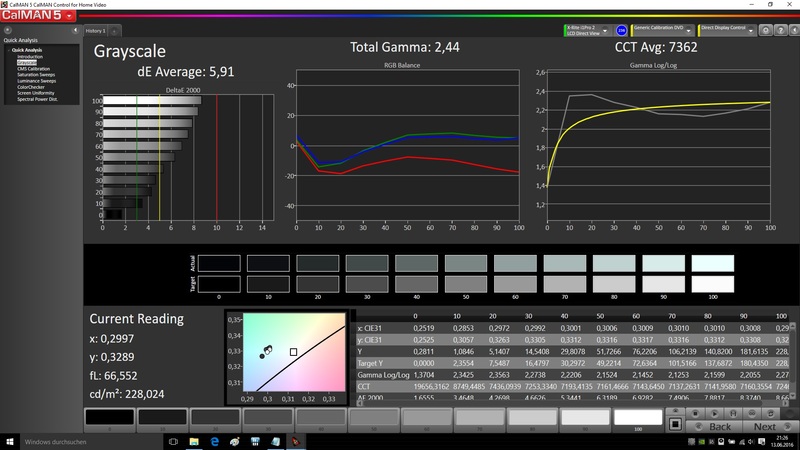 However: based on our tests with the software CalMan, the Omen is not suitable for the professional users, as the graylevels, RGB balance, saturation and accuracy are just not good enough. 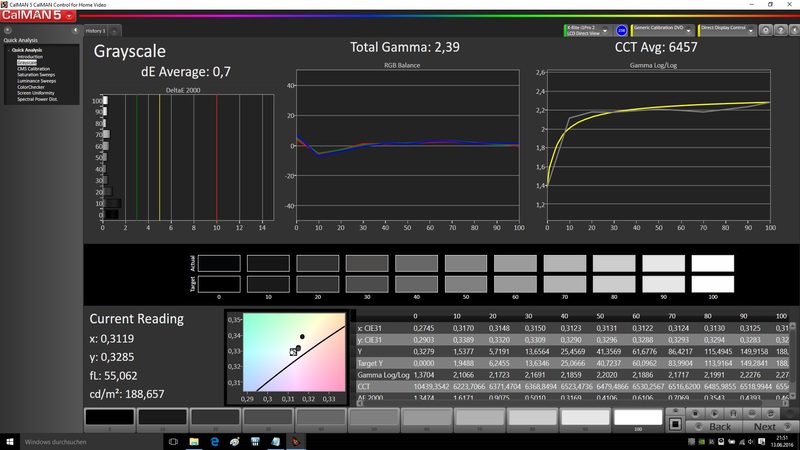 Even a calibration didn't improve the results by much. Users who aren't overly demanding, are willing to avoid sunlight and want to use the notebook mostly for gaming, won't necessarily be dissatisfied. 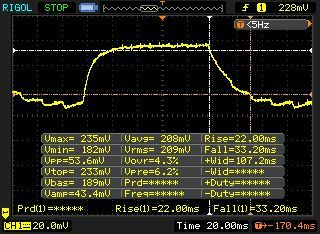 Backlight bleeding wasn't any issue, even though the brightness distribution of 79 % suggests otherwise. 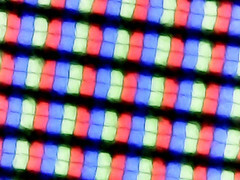 The viewing angles are typical for IPS displays and much more extensive when compared to panels based on TN technology. In comparison, all tested devices range from 0.8 (minimum) to 240 (maximum) ms. » 78 % of all devices are better. In comparison, all tested devices range from 0.9 (minimum) to 636 (maximum) ms. » 90 % of all devices are better. Even though Nvidia set extremely high standards with their GeForce GTX 980, the GeForce GTX 965M is no slouch either and can certainly be considered high-end. The card is accompanied by 16 GB of DDR4 RAM and a quad-core CPU. The hard drive is also very large at 2128 GB. 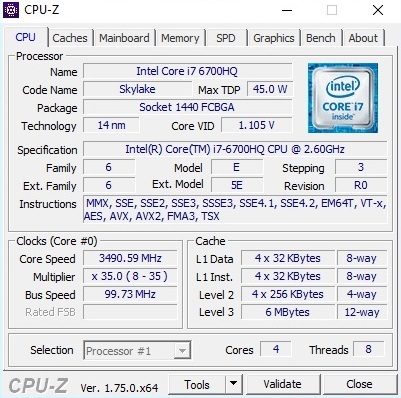 As mentioned earlier, the Core i7-6700HQ is part of Intel's Skylake-generation of processors. 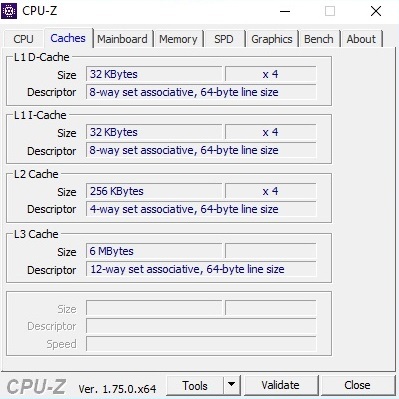 Thanks to Hyper Threading (up to 8 threads in parallel) and the efficient architecture (performance per MHz), the 14 nm chip offers a lot of performance and has no issues handling most applications. 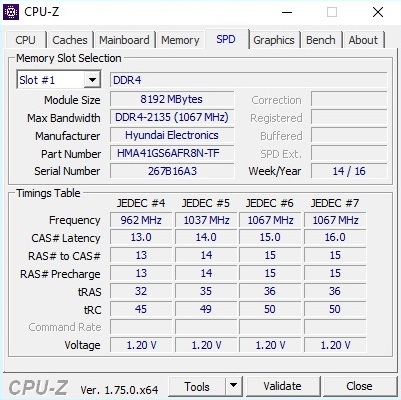 The TDP is 45 watts according to Intel, which is slightly below the level of the Broadwell and Haswell predecessors at 47 watts each. Compared to the older Core i7-4710HQ in the previous Omen, the Core i7-6700HQ offers 5 % more performance on average. 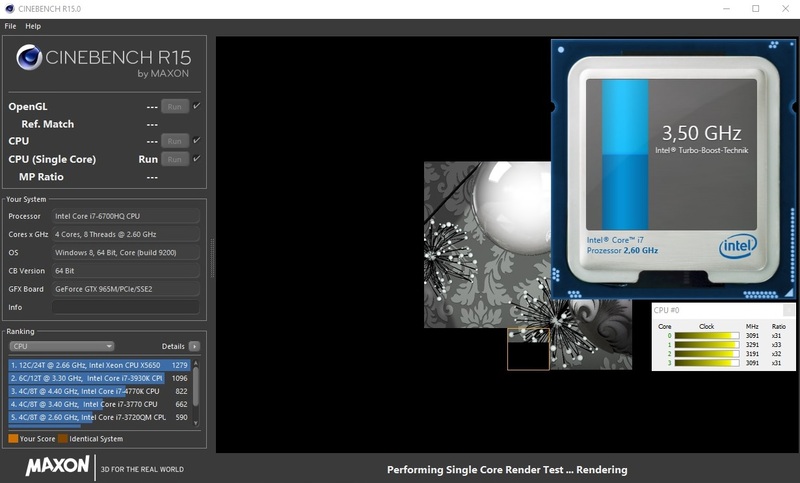 Only during the Single-Core portion of the Cinebench R15, the Skylake processor edges out the predecessors by about 10 %. The advantage can be attributed to the observed clock rate: the new CPU reaches its Turbo Boost limit more frequently. The recorded maximum of 3.5 GHz during the Single-Core and 3.1 GHz during the Multi-Core portion correspond to Intel's advertised maximum. 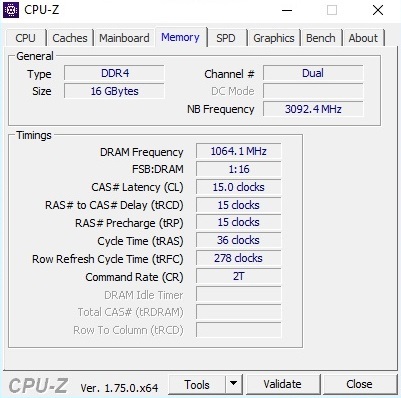 Only under maximum load the Core i7-6700HQ hits its limits. 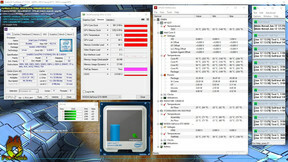 During the test with Prime95, the Turbo turned off after a short while and the CPU throttled down slightly to 2.3 GHz. We do observe this behavior quite frequently in our reviews, however. 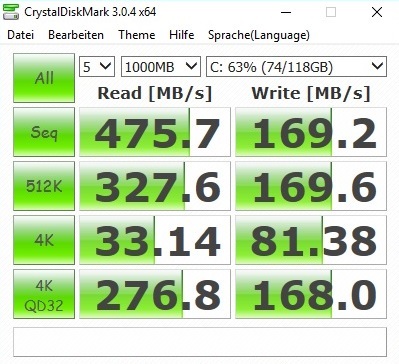 Since Windows is installed on a Solid State Drive, the system performance is pretty convincing. At 3946 and 4992, respectively, for the Home and Creative portion of the PCMark 8 benchmark test, the Omen edges out the competition by a few percent. Subjectively, the notebook is speedy and responsive. We don't wholeheartedly agree with HP's choice of storage drives. 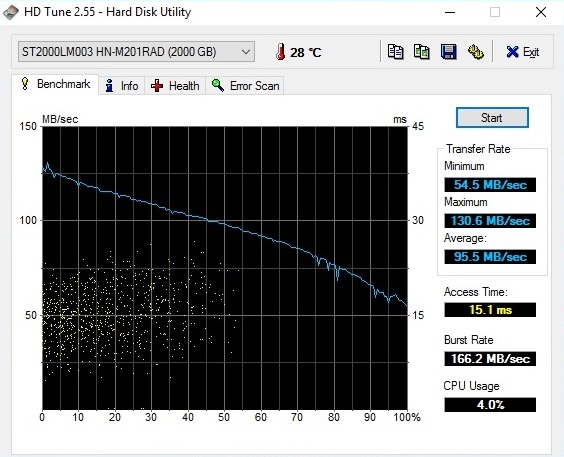 The 2 TB HDD performs well for a conventional hard drive at speeds of up to 126 MB/s according to CrystalDiskMark. 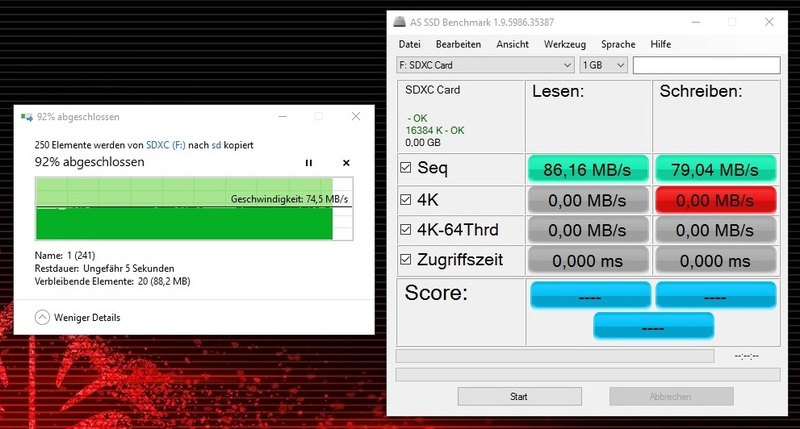 The 128 GB SSD from Adata suffers from poor write speeds: 160 MB/s during the sequential write test of the AS SSD benchmark are far from impressive. We would have expected performance comparable to other Solid State Drives, which post speeds of 300-400 MB/s. 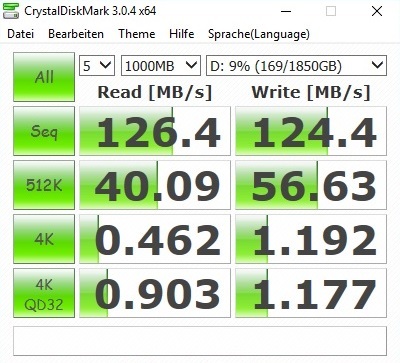 The 17-inch sibling is available with larger and potentially faster SSDs, but considering that our 15-inch review model sells for 1000 Euro (~$1130), we would have expected better performance. 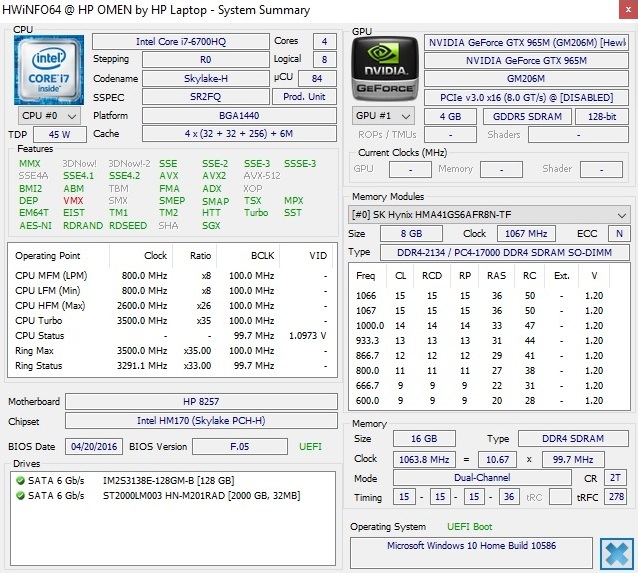 As the table shows, the SSD the previous Omen was equipped with was up to three times faster. 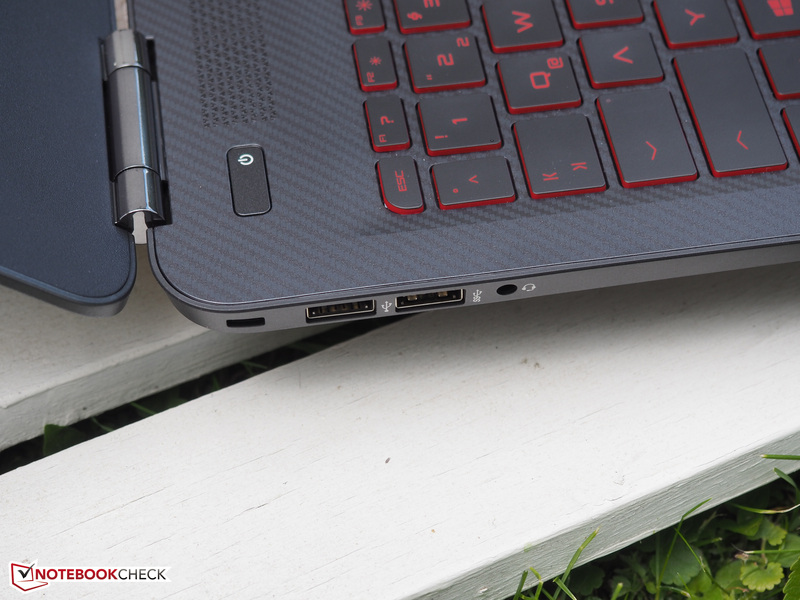 Performance-wise, our review notebook falls between the Acer VN7-592G-79DV and the Asus G501VW-FY081T. The latter notebook posts slightly slower write speeds compared to the review notebook. 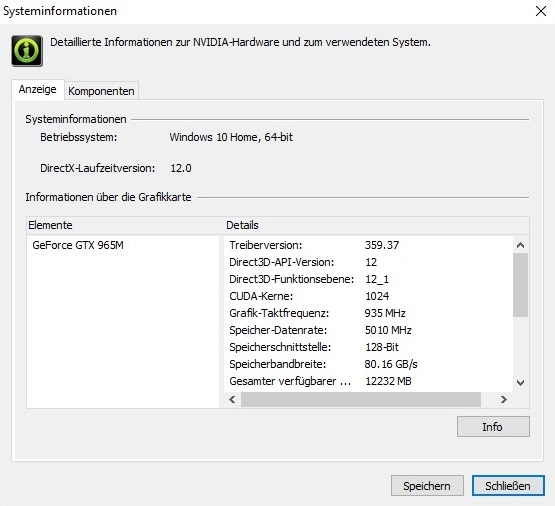 The GeForce GTX 965M GPU exists in two versions. In the beginning of 2016, Nvidia released a refresh of their high-end model, which offers a much higher Turbo frequency (maximum of 1150 vs. 950 MHz) and is based on a new chip (GM204 vs. GM206). The number of shaders and the amount of RAM are identical, however (1024 CUDA cores and 2-4 GB of RAM). HP steps up to the plate here and equips the Omen with 4 GB of GDDR5 VRAM, which is a good choice considering how some games are true resource hogs. Many modern games (Doom, Assassin's Creed Syndicate, Rise of the Tomb Raider, ...) need more than 2 GB of RAM at higher resolutions and settings. 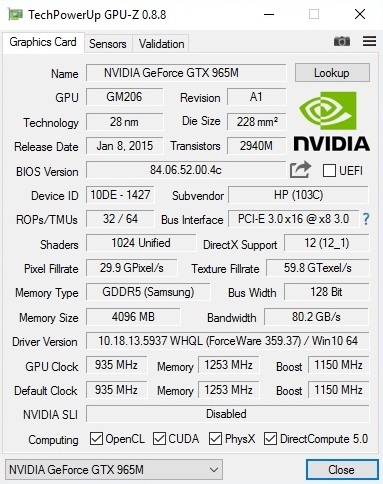 Thanks to the updates, the GeForce GTX 965M is significantly faster than the GTX 960M and is able to close the performance gap to the GTX 970M, which was miles ahead in the past. 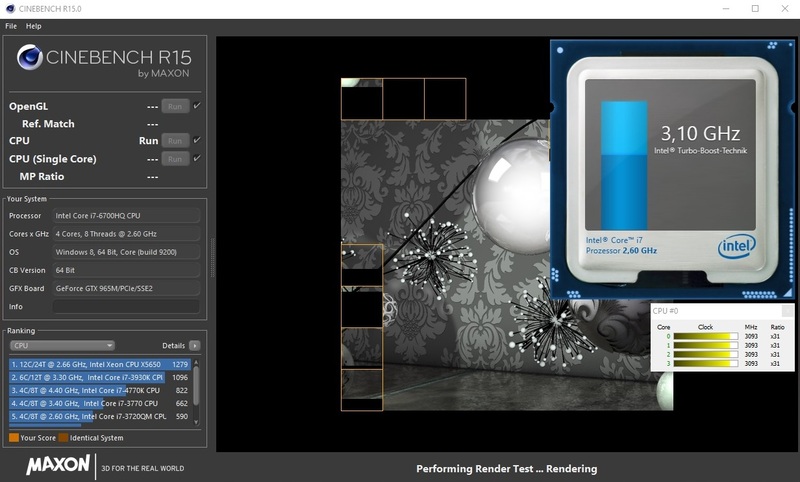 As an example, lets take a look at the Fire Strike test of the 3DMark 13 benchmark test. 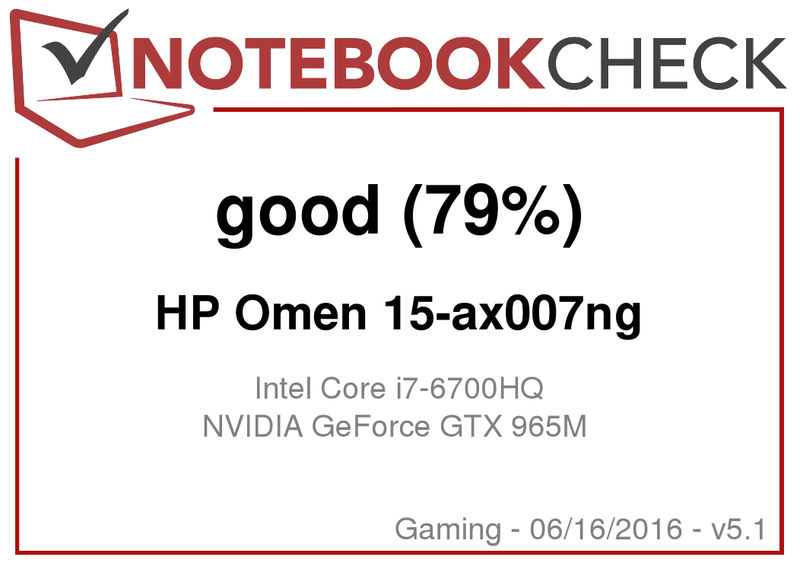 With a GPU score of 5904 points, the Omen beats other notebooks equipped with the GTX 960M by more than 35 % (+50 % vs. GTX 860M). 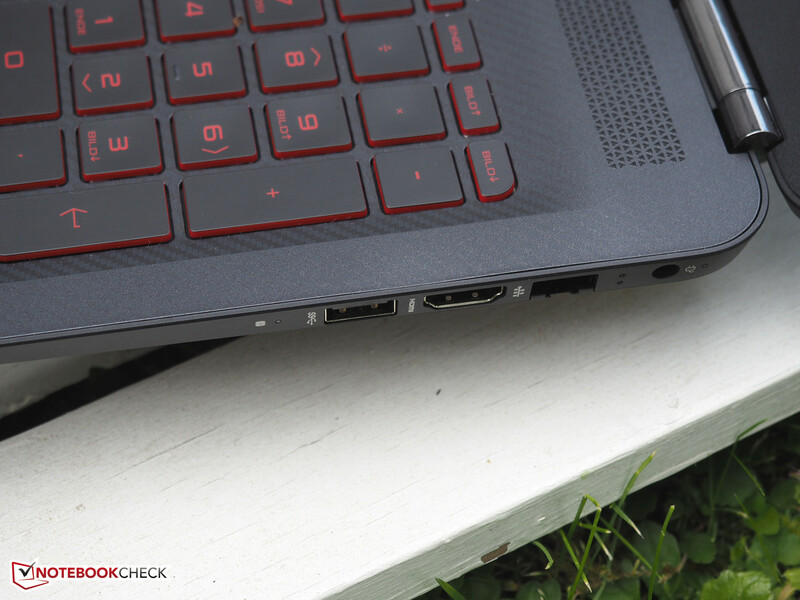 GTX 970M-equipped notebooks are faster by about 26 %, however. Users who don't need maximum details at all times should be happy with the performance. 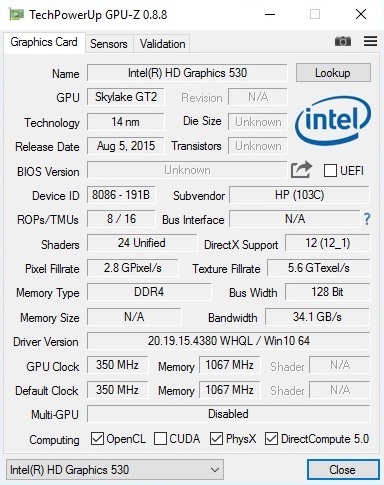 Most games run stutter-free at 1920 x 1080 pixels and the settings on high. Only very demanding titles like XCOM 2, The Division and Hitman don't surpass 35 fps. 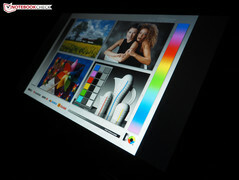 In this case, the details need to be reduced to medium or the resolution needs to be lowered. The GTX 965M isn't suited all too well for gaming at 4K (3840 x 2160), which is why our staff would pick the Omen with FHD and not the 4K panel. At least we were able to use the newer drivers from the Nvidia homepage. An update to the current ForceWare 368.39 driver during the review period resolved most of the issues. Noise sensitive users might not be completely happy with the HP Omen. 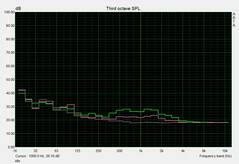 Both fans never turn off completely (~33 dB idle) and emit up to 49 dB under load, which might be too loud for some ears. During "normal" 3D operation, the notebook emits 38-45 dB. The average noise level of 43 dB we measured during the 3DMark 06 benchmark compares well to the competitors, which emit 40 dB (Schenker XMG A516) to 45 dB (Acer V15 Nitro BE). The temperatures are middle-of-the-road as well. After maximum load for one hour with Furmark and Prime95, the Omen reached 48 °C on the top and 59 °C on the bottom. Gaming sessions with the 15-inch notebook on the lap are not recommended. 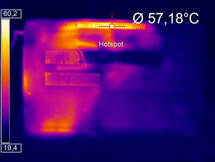 During idle, the chassis remains remarkably cool - we measured about 25 °C after two hours, which is quite impressive. 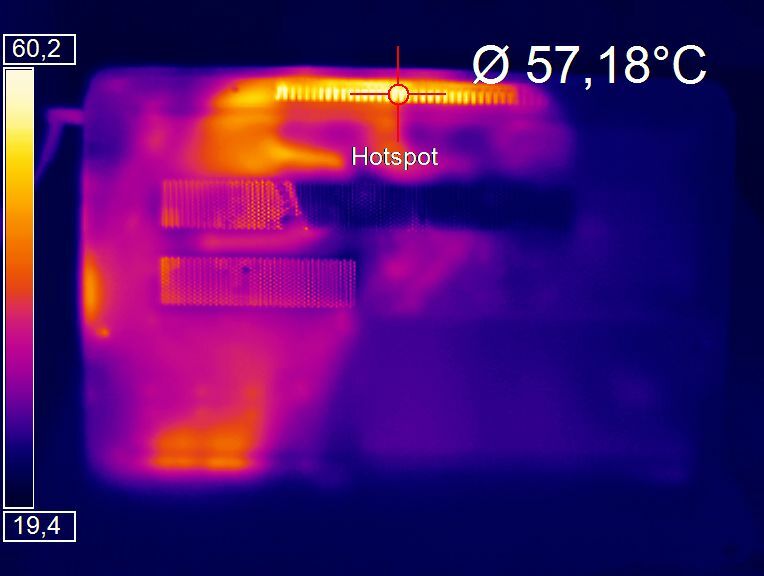 The hardware is less lucky: during the stress test, the CPU and the GPU both exceeded 90 °C. These values are very high and clearly show the limit of the cooling system. 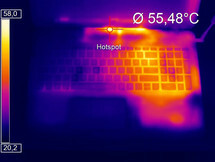 (-) The average temperature for the upper side under maximal load is 40 °C / 104 F, compared to the average of 32.9 °C / 91 F for the devices in the class Gaming. 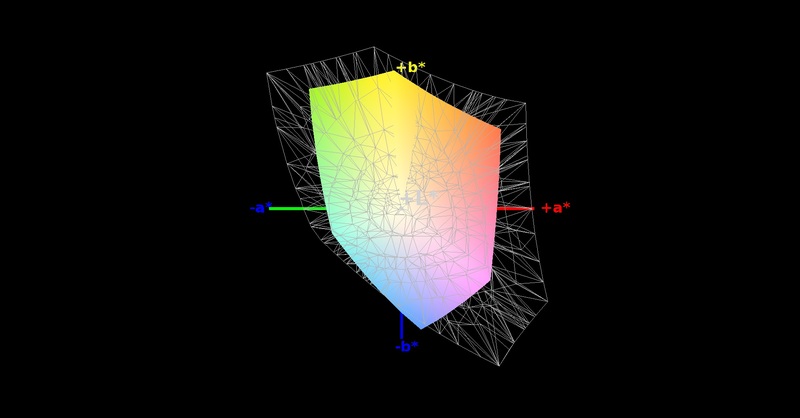 (-) The maximum temperature on the upper side is 48.5 °C / 119 F, compared to the average of 39.3 °C / 103 F, ranging from 21.6 to 68.8 °C for the class Gaming. 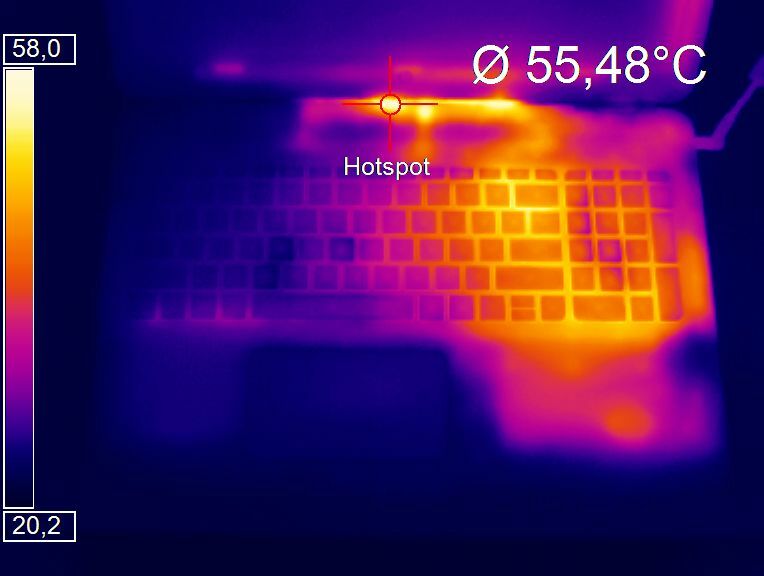 (+) In idle usage, the average temperature for the upper side is 26 °C / 79 F, compared to the device average of 32.9 °C / 91 F.
(-) The palmrests and touchpad can get very hot to the touch with a maximum of 41.2 °C / 106.2 F.
(-) The average temperature of the palmrest area of similar devices was 28.7 °C / 83.7 F (-12.5 °C / -22.5 F). Be it Beats or Bang and Olufsen: HP loves to use well-known names when it comes to audio systems. If the collaboration is worth it depends on the notebook in question. The Omen's sound is unconvincing. Although the pre-installed software offers different settings (music, movie & voice) and an equalizer, the result is unimpressive. Just like many other notebooks, the audio is unbalanced, tinny and unrefined - despite of the decent maximum volume. The lack of a subwoofer is also noticeable. We would definitely recommend a headset or external speakers. The power consumption doesn't stand out - neither negatively nor positively. 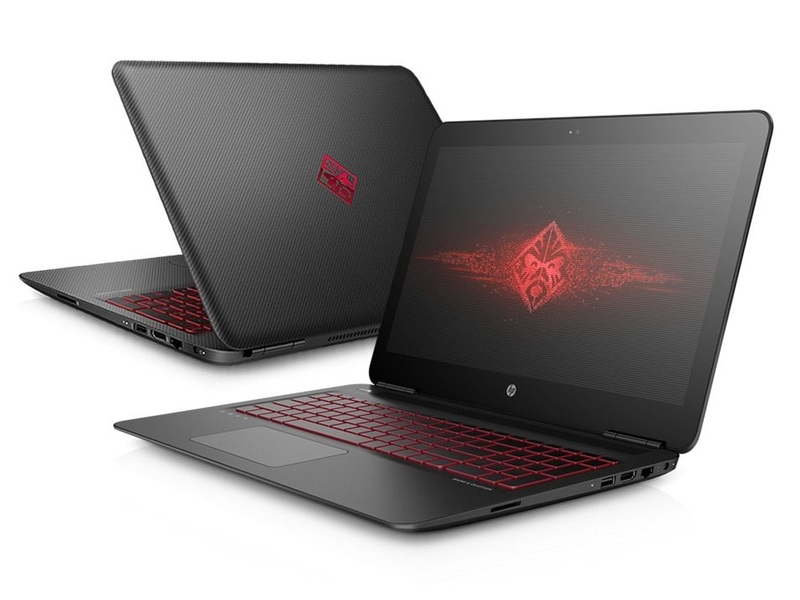 HP uses Nvidia's Optimus technology, which switches between the GeForce GTX 965M and the integrated HD Graphics 530 depending on usage. 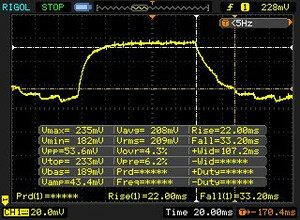 The 15-inch notebook is pretty frugal during idle - we measured 7-19 watts, which is significantly better than the predecessor (15-24 watts). Under load, the power draw increases manyfold. 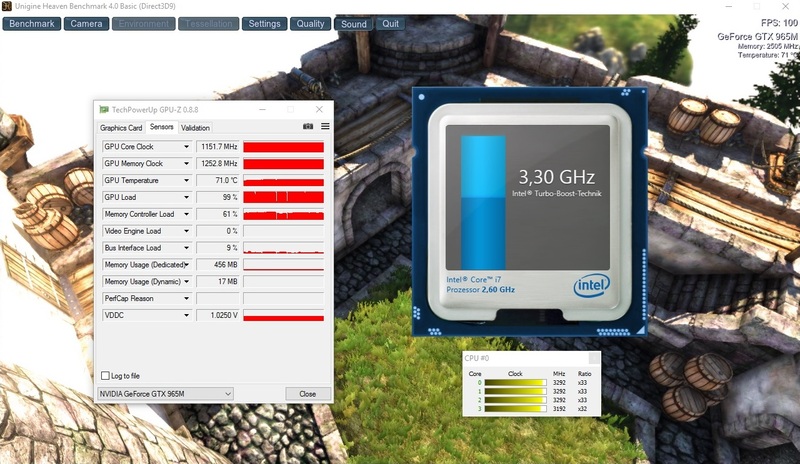 Our instrument recorded 79 watts during the first scene of the 3DMark 06 benchmark test. 119 watts under load would indicate that the power adapter is sized adequately - but the stress test drains the battery, so 150 watts might have been a better choice. We'd call the run times "decent". We recorded a maximum of 8 hours during idle with the screen on its dimmest setting and about 1.5 hours under load at full brightness while gaming. Surfing over WiFi is possible for about 4.5 hours; watching movies (HD) for about 4 hours. 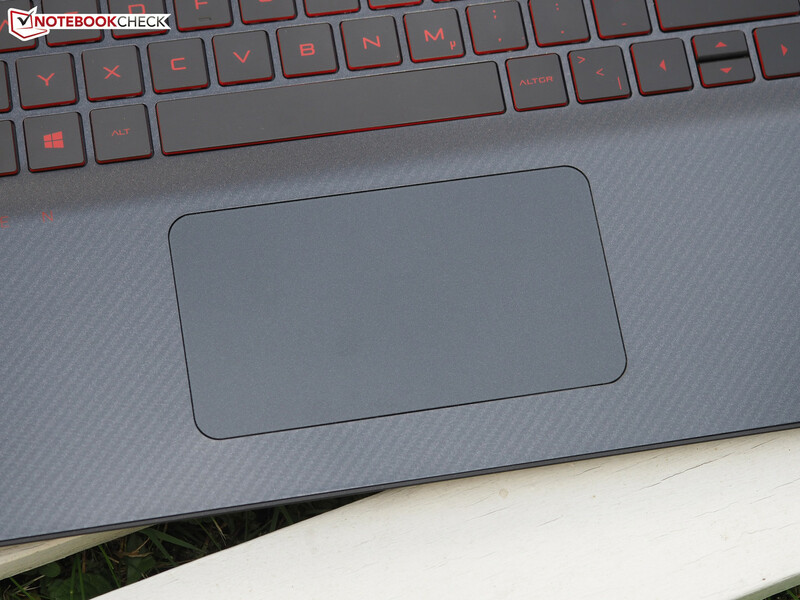 Faced with stiff (gaming) competition, the HP Omen has a hard time standing out. 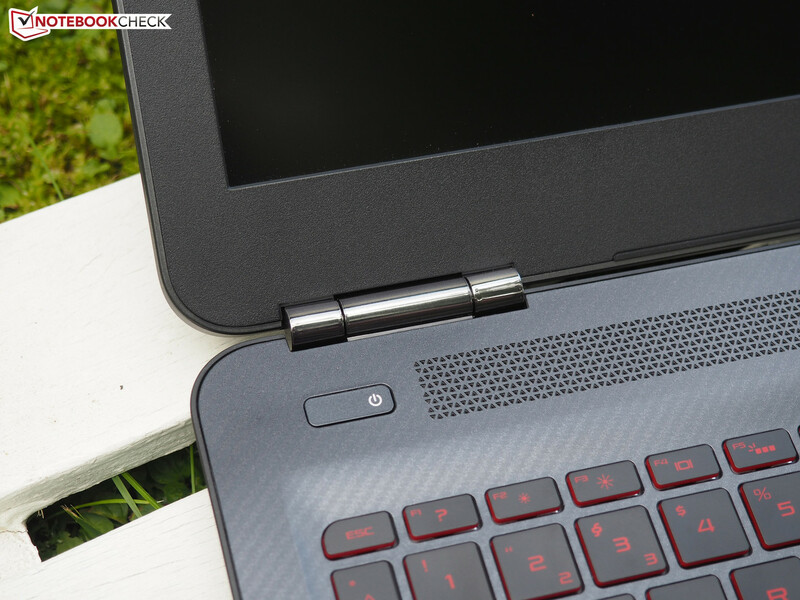 While one can't really go wrong with the 15-inch system, the notebook nonetheless fails to make it into our Top 10 and much less all the way to the top of our charts. The high-end notebook misses the 80 percent mark for two main reasons. 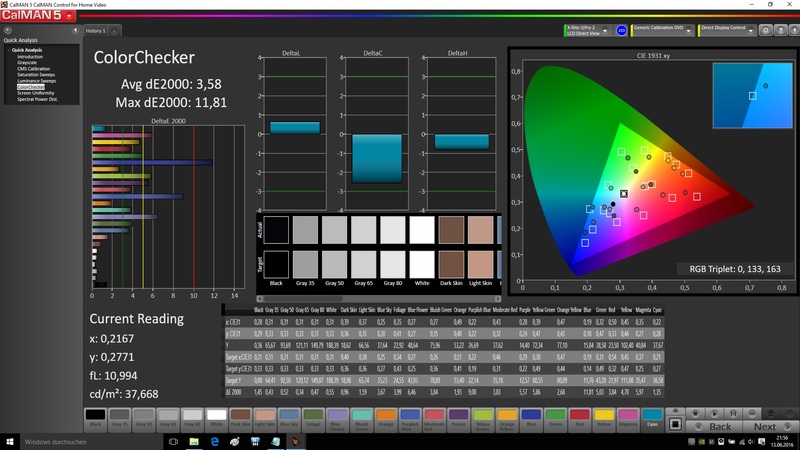 Firstly, unlike most manufacturers, HP incorporates a - from a quality standpoint - just average FHD display. Both the brightness as well as color coverage don't quite measure up to the high price (a 4K panel is optional). Secondly, the Omen's port selection is rather meager. In 2016, a notebook costing 1300 Euro (~$1470) should feature at least a DisplayPort and a USB 3.1 Gen2 port - at least in our opinion. The quality of the speakers and the chassis (creaking sounds etc.) could also be improved. All in all, we found working with the Omen still to be an enjoyable experience, since there are no show-stopping shortcomings. 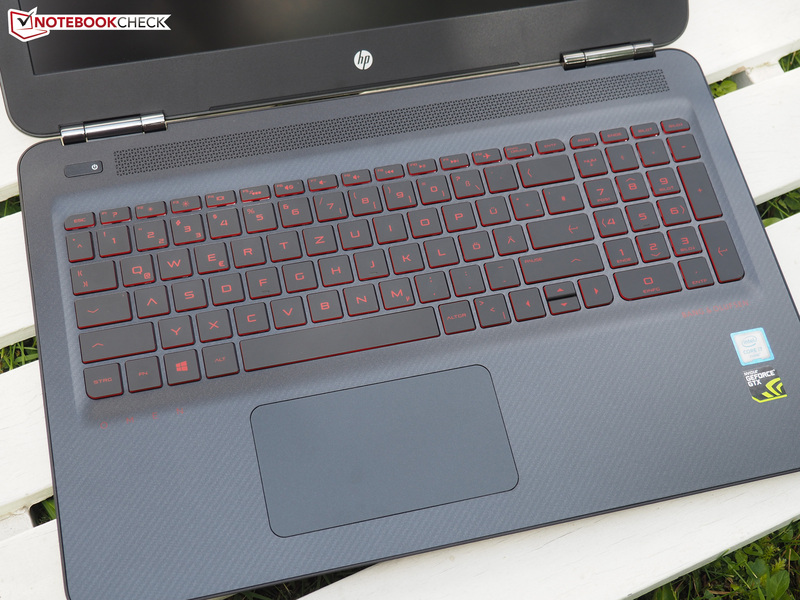 Despite the aforementioned flaws, the 15-inch HP Omen is a well-rounded and good-looking gaming notebook. For occasional gamers, the Omen is worth a consideration! Ended up in the IT sector in the 90s more or less accidentally and have remained in the industry (as a sysadmin) ever since. Always been interested in laptops - first purchase was - if memory serves correctly - a Toshiba Satellite T2115CS with DX4-75 processor, 4 MB of RAM and 350 MB hard disk drive (and Windows 3.1). To this day, laptops appeal to me - much to the chagrin of my wife, who doesn’t seem understand why we need 5-10 of them at any given time ;-).